This How-To explains all of the lobby options. There are no real steps involved. Sound on Nickname in Message: This option plays a sound when someone says your exact nickname in the lobby. Nickname Sound Option: This option allows you to customize the sound when someone says your nickname in the lobby. Font Type: This option allows you to change your font type. We recommend using an easy to read font. Text Size: This option changes the text size of everyone's chat. This is only visible to you. Text Color: This option allows you to change the color of your text. We recommend an easy to see color. Text color is disabled for players using "Easy Read Chat." Time Stamp Chat: This option shows the time and date next to every message. To shorten it, click "Time Only." Show Emoticons: This allows you to see "smileys" in the chat lobby. Play Sounds in Lobby: This option allows you to hear various lobby sounds. This includes the noise when you get a PM, a Flag enters, or someone says your name. Don't Receive PM's: This option disables all in-room private messages. We do not recommend using this function, as staff members may need to contact you. If your PM's are off, they may be forced to use warning boxes. Easy Read Chat: This displays all chat in a basic font and color for easy readability. Clickable Weblinks: This allows links to be directly clicked on. 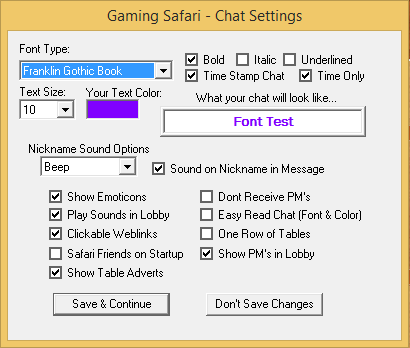 Note: Gaming Safari is not responsible for the content of non-Gaming Safari links in lobbies. One Row of Tables: This hides a row of tables. Safari Friends on Startup: This allows Safari Friends to load when you enter a lobby. If you disable this, you may still open Safari Friends by clicking on Start Safari Friends in the Options menu. Show PM's in Lobby: This allows you to have your PM's show as a line in the chat, instead of as a popup box. Note: Even though your PM's will show in the chat area, only you and the sender can see the message.